What is the Best Way to Optimize Your Firearms Website for Voice Search? As you’ve probably noticed by now, everyone is using voice search these days. More and more, your customers are bypassing Google’s minimalist homepage and opting to simply ask an app — backed by artificial intelligence—to find what they are looking for. The change isn’t being driven solely by mobile devices, either – digital assistants are making their way into operating systems, bringing voice search capability to traditional Windows (Cortana) and Apple (Siri) laptop and desktop computers. For the average internet user, this means more convenience than ever. For a marketer, though, the rise of these tools poses a brand-new question: how do you optimize your website for voice search? In this post, we give you a few things to consider and how to prepare for the future. 40% of adults now use voice search once per day, according to Location World. Some predict, 50% of all searches will be voice searches by 2020. If you want to capture voice search traffic (and you should), then it’s important to realize that these types of queries aren’t structured in terms of traditional keywords. Instead, they are spoken in a natural language question-and-answer format. Although exact matching has become less important and relevant in recent SEO iterations, it does still hold weight with voice search. So, having text, titles, and headlines like the one we used above – how do you optimize your firearms website for voice search? – can be helpful. The more of this type of content you have on your website, the easier it’s going to be for voice searchers to find you. For firearm marketers who are used to thinking in terms of market-based keywords, posting content in natural language terms can actually feel a bit awkward. Besides, you don’t want to undo your existing SEO efforts to capture voice search traffic. Knowing that one great idea is to simply beef up your Frequently Asked Questions page. This is the one place on your website where you can post as many natural language phrases as you want, and they are likely to be structured in a way that Google can easily crawl and understand. Additionally, you might consider adding separate pages or blog posts for questions that come up often or point specifically to your expertise. Articles like this one can standout in Google’s search listings without making your FAQ pages seem unnecessarily long. As with anything else in search engine optimization, finding the right targets is every bit as important as executing your plan. And with nearly 50% of people now using voice search when researching products (Source: Social Media Today), you should do what you can to identify the kinds of questions your best customers are likely to ask when using voice-assisted search apps. How much does a gun safe cost? Where is the closest gun range? What is Springfield Armory’s XDE Series warranty? How do I attract Millennial gun buyers? Naturally, you could begin by evaluating the kinds of things buyers tend to ask you about on phone calls, chats or during face-to-face meetings. You could also look into your web analytics to see what searchers are typing into Google that leads them to arrive at your website. Another good source for material is Google’s own auto-complete function, which could suggest natural language question combinations to you. Each of these is a good way to brainstorm new ideas, and all of them can help you bring more voice searchers to your site. At the moment, that simply means you have one more edge over your online competitors. As voice search becomes more and more popular, though, it could put you on the cutting-edge of SEO for years to come. If you could use some internet marketing and search engine optimization advice that’s tailored to your business and challenges, now is the perfect time to schedule a free consultation with our team and see how we can help. The future is coming! Over the past 17+ years as a designer/marketer—I’ve experienced many successes as well as failures. To fail is human, and to fail is to get better—as long as you learn from your mistakes and don’t give up. After some recent time off and reflection on a recent face plant—I asked myself, how can I reduce failure and improve my processes, so I don’t repeat them? In this “rubber meets the road” post, I want to share five hard-learned “successful failures.” I call them “successful failures” because I have learned from these “biffs” which have made me a better marketing professional and person. I hope you can apply some of these to your own business or marketing career—whether you work for a firearm brand or are going it alone. 1. Always identify the problem you’re solving. I was recently approached by a large brand with the goal of expanding market share. They didn’t know how, why or where to start. This vague and all-encompassing goal had no clear finish line. After much time and thought I realized I had nowhere to start on building a strategy because the goal was too broad. After going back to get the information I needed, I was met with resistance because the VP was not open to new ideas. This left me with a proposal that talked in circles and that was ultimately turned down. When goals are not defined, they end up causing a lot of confusion. Pain must be identified to find the problem you’re trying to solve. If the goal isn’t black and white; figuring out which way to proceed can be costly. Lesson: Define the pain points you’re trying to solve for and use the SMART method to determine your strategy. Get to the heart of the problem and stick to it. When things start to veer off-course—always point back to the goal you and your team agreed on. Do not accept directions or requests that are vague. 2. You can’t put lipstick on a pig. Several years ago, I worked with a start-up who came to me with the goal of quadrupling their online sales in one year. The company was unknown, and the product had several flaws. They had ample budget from the start but soon ran out of money once the program didn’t bring in the expected revenue. This was mostly due to product returns, complaints and the fact this product was more of “nice to have” than a “have to have.” Plus, the product was overpriced and their website was poorly designed and loaded slowly. They raised more money, tried a different marketing approach with a different firm which also failed. They eventually went out of business. I receive calls weekly from start-ups and entrepreneurs who claim their product is a game changer. In my early days, I would take any project that came across my desk. But after several failed projects—like the one listed above, I now know better. What is the problem this product solves? Is there a large group of people who have this same problem? Does this product address the problem in an easy way? Does this product disrupt a category? Is it the right timing for this product? What trends can this product ride? Can I work with this person or company? What will it take to achieve this business’s goals? After the above ten questions are answered—I’ll usually have a good idea on whether or not we can help them and go back to schedule a longer exploratory call. It’s taken a long time to get to this point of understanding and many setbacks. Lesson: All the marketing in the world won’t make a bad product good. 3. Pick the right projects and learn how to “manage your boss” (or client). I’ve met many hard-charging entrepreneurs, business owners and marketers over the years—and one thing I’ve learned through—trial and error—is how to best manage them. I’ve worked with many individuals who I’ve liked, some who have become good friends and others who I’d rather not ever think about again. Everyone is different and everyone has different expectations, ways of learning communicating and working. It’s up to you to figure out how to best manage the relationship. In his book, Managing Oneself, Peter Drucker explains how to figure out the best way to work with your boss (or clients) through understanding your strengths, weaknesses, how you work, how you learn, your values and how you can best contribute to your organization. “Bosses are neither a title on the organization chart nor a “function.” They are individuals and are entitled to do their best work in the way they do it best. It is incumbent on the people who work with them to observe them, to find out how they work, and to adapt themselves to what makes their bosses (or clients) most effective. This, is fact, is the secret of “managing” the boss. Lesson: Learn who you are, what you’re best at, how you learn and how you best work. Keep to your core set of skills and inform the people that you work with how you work. Then learn how your clients, boss or co-workers work. This will make for better business relationships and ultimately better marketing outcomes. I’m very eager to please my clients—and this has gotten me in a lot of trouble when the production schedule gets off track. By saying you’ll have it done on Tuesday and then are not able to deliver it till Friday because a hundred things popped up (hacked website, downed servers, file transfers, email issues or just life in general) will tarnish your reputation and leave people questioning whether they made the right decision to hire you. Or, you rush through the deliverable to find out (from the client) it’s riddled with spelling errors and missed requests. 5. Don’t deviate from your core skill set. I try to focus on three disciplines: brand development, design and utilize inbound marketing tactics to deliver my client’s brand to their customers. When I find myself talking to clients about things out of my core area of expertise, things start to go sideways and I end up trying to stick a round peg into a square hole. Lesson: Stick with your core skill set and don’t be afraid to say, “I don’t know.” Find experts in the areas you need help with. You will cause yourself less stress and deliver a better work product. 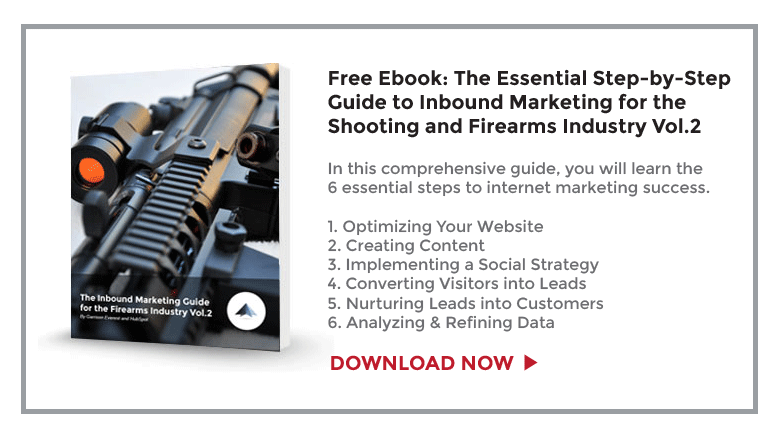 To sum up, marketing a firearm business can be extremely difficult—filled with failures, restarts, and do-overs. This is a competitive industry. Sometimes you need to figure it out as you go before finding out what works. It took NASA over twelve attempts to get a rocket off the launch pad (Source: Wikipedia). Imagine if NASA would have given up after the 11th try. There’d be a Russian flag on the Moon rather than the Stars and Stripes. Hard-lessons make us better. The world was built on them. So no matter where you’re at, keep at it. You might be one month away from a breakthrough that will change your life and business forever. Keep trying and don’t give up. Figure out what you’re best at and focus on getting better. Slow down, over communicate, fail often—fail fast and always keep striving to achieve your goals, no matter what they are. Questions. Comments? Comment below or send me an email.